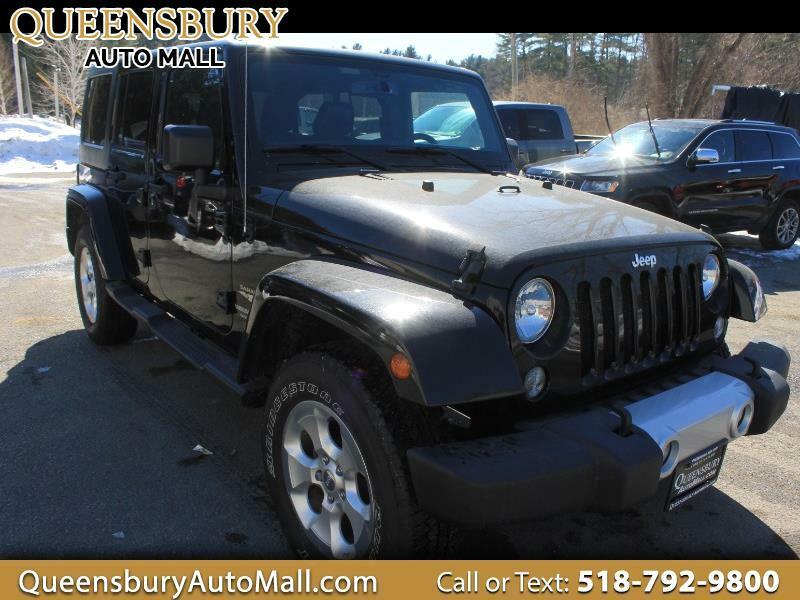 ***REDUCED PRICING - IF WE WERE WATCHING PIRATES OF THE CARRIBEAN YOU MIGHT BE FAMILIAR WITH THE LEGENDARY BLACK PEARL VESSEL WELL LOOK NO FURTHER THAN THE BLACK PEARL DUAL TOPPED FOR MAXIMUM ADVENTURE 2015 JEEP WRANGLER UNLIMITED SAHARA 4 DOOR 4X4 ABSOLUTELY FULLY LOADED AND WITH LOW MILEAGE - TRADE IN YOUR OLD RIDE TODAY AND LETS UPGRADE YOU INTO THIS BEAUTY STOP BY 635 GLEN STREET IN QUEENSBURY, NY 12804 WE WANT TO SEE YOU SOON*** 3.6L V6 DOHC 24V FFV MOTOR! CLEAN CARFAX HISTORY REPORT! FOUR WHEEL DRIVE WITH LOCKING TRANSFER CASE! 6 SPEED MANUAL TRANSMISSION! DUAL TOPS REMOVABLE SOFT TOP AND REMOVABLE HARD TOP! HEATED LEATHER INTERIOR SEATING CAPACITY! TOW PACKAGE WITH TRAILER HITCH RECEIVER AND OVER DRIVE HAUL MODE! KEYLESS REMOTE ENTRY AND KEYLESS REMOTE STARTER! TOUCH LED HOME SCREEN WITH REAR VISION BACKUP CAMERA AND GPS NAVIGATION SYSTEM! PREMIUM ALPINE AUDIO SYSTEM WITH AM/FM/CD PLAYER WITH AUXILIARY INPUT JACK AND SATELLITE RADIO! FULL CABIN HEATING AND AIR CONDITIONING! REAR WINDOW DEFROSTER AND REAR WINDOW WIPERS! SPLIT FOLD REAR SEATS! TINTED PRIVACY WINDOWS! FULL POWER EQUIPMENT! ALLOY WHEELS ON FRESH TIRES!